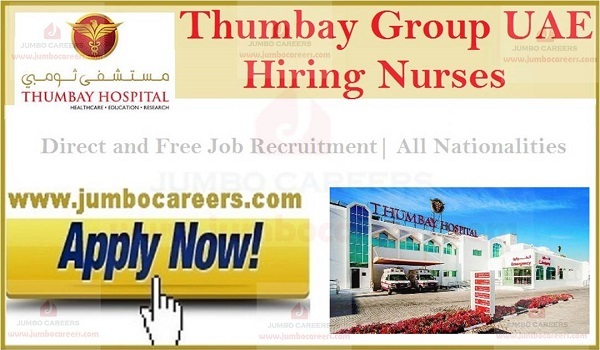 Thumbay Group UAE which owns Gulf Medical University and chain of Thumbay Hospitals and Clinics in UAE conducting latest walk in interview for hiring MOH Nurses. Its a direct and free job recruitment by Thumbay Group UAE with attractive salary and perks. About Thumbay Group: Thumbay Group, is a UAE - based diversified international business conglomerate, headquartered in DIFC - Dubai, with operations across 20 sectors including Education, Healthcare, Medical Research, Diagnostics, Retail Pharmacy, Health Communications, Retail Opticals, Wellness, Nutrition Stores, Hospitality, Real Estate, Publishing, Technology, Media, Events, Medical Tourism, Trading and Marketing & Distribution. Core Skills : Nursing, Customer Care, Communication, Recording, Reporting, Telephonic etc. Location : Gulf Medical University, P.O Box #4184, Behind Sheikh Khalifa Hospital, Al Jurf, Ajman.